You are here: Home / Weekly Columns / Opinion / Roku Premiere Plus: Not The Best, But The Cheapest 4K Streaming Device. Roku Premiere Plus: Not The Best, But The Cheapest 4K Streaming Device. (ThyBlackMan.com) Roku Premiere and Roku Premiere Plus are the cheapest 4K streaming devices you can buy in the market. They are certainly not the best as they lack headphone jack for private listening. Roku Premiere also lacks a voice search enabled remote. But if you are on a budget, these 4K streaming devices are the best money can buy. Now is the best time to cut the cords and choose multimedia streaming devices. A lot of content is available to watch and with Dolby Atmos and 4K support, streaming and sound quality have become better than ever. Roku has been in the market for a while now and the company is improving its hardware that serves streams. Keeping the other 4K streaming devices like Amazon Fire TV Stick 4K aside, Roku itself has a wide range of products that offer almost the same core functionality. There are seven Roku devices in the streaming player category and choosing the best among all can be confusing. The best thing about Roku devices is that they offer more for less. With the arrival of Smart 4K TVs, the competition is pretty tough for independent streaming devices. As a result, consumers are getting more features by paying less. Roku Premiere and Roku Premiere Plus 2018 are new devices with some major improvements. The first one is a powerful streaming device that offers excellent picture quality using 4K and HD graphics technology. Its big brother, the Roku Premiere Plus, does even more by supporting 4K, HDR, and a remote that supports voice search and features power and volume buttons, so you can control your TV using the same remote. The Roku Premiere Plus unboxing helped us know what’s inside the box. You get the Roku player, an enhanced remote, and batteries for the remote, an HDMI cable, a USB cable, a sticky strip, and a user manual. If you’re wondering how to set up Roku Premiere Plus with your TV, here’s how you can do it. Open the box and keep all the accessories and the main device connected. Now take the batteries out and put them in the remote. There’s a small light on the remote that starts flashing which means your remote is ready to pair. Now plug the player in and connect the device with your TV using the HDMI cable. If the remote is not getting paired, there’s a small pairing button which you can press. Don’t worry about the setup because when you use the device for the first time, you will see a guide on your TV. Once successful, connect your Roku Premiere Plus to the internet. You’ll be asked to log in to your Roku account, enter your details and you’re good to go. After the setup, your player may download the latest software. Wait for a few seconds and let the player finish downloading the new software. The best thing about Roku players is that they automatically detect the best resolution according to your TV’s display. 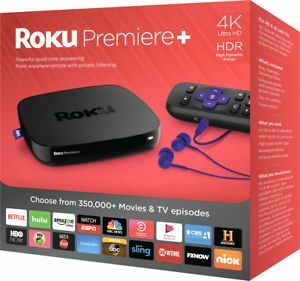 Which one is better: Roku Premiere or Roku Premiere Plus? You may be thinking about the key differences between the Roku Premiere and Premiere Plus. The major difference between the two streaming devices is voice control. There’s an extra button on the Premiere Plus remote that allows you to play content. It’s a faster method of choosing content as you don’t have to search manually. The standard Premiere supports voice commands through an app, but it is not as reliable as the Plus because the remote doesn’t have a microphone, so you will need to download the Roku app on your mobile phone. Unlike the low-end Premier device, the Plus remote can be used to control your TV. Both the devices support HD and 4K TV resolutions with HDR and Dolby Atmos support. The only thing that hurts fans is lack of support for faster Wi-Fi as the connectivity is limited to 802.11n. For people living in apartments or in remote areas, the standard 2.4 GHz WI-Fi is not an ideal solution. Roku Premiere is available at $39.99 and the Roku Premiere Plus costs $10 more. Both the devices are arguably the cheapest 4K streaming device. Even if they are not the best, there’s nothing you can find as cheap and reliable as these two streaming players in this price range.